Pediatric resuscitations are stressful at the best of times and pediatric medication doses can be complicated, increasing the risk of medication errors. This group came up with an ingenious solution: single pre-filled syringes that are color-coded in a rainbow pattern that corresponds to the Broselow tape we all know and love. All you have to do is discard down to the color that corresponds to the size of the child and you are sure to be giving the right dose (best explained by looking at a picture).This study assessed the speed and accuracy of medication administration in simulated pediatric resuscitations. 10 teams consisting of physicians and nurses participated in a cross over study, so that they did one simulation with the new syringes and one without. Time to delivery of medications was quicker with the new syringes (47 versus 19 seconds, a difference of 27 seconds; 95%CI 21-33 seconds). 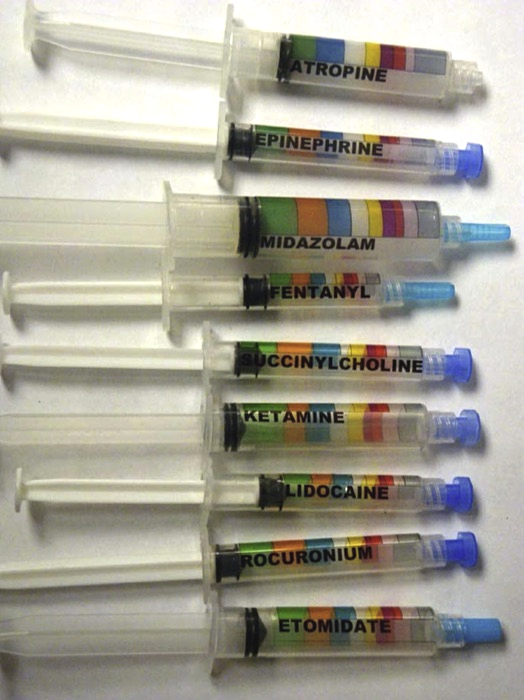 Teams were also more accurate using the new color-coded syringes, with dosing errors occurring 17% of the time with the conventional approach and 0% of the time with the new syringes (absolute difference 17%; 95% CI 4-30%). Obviously a simulation based study is not real life – but I would actually expect more stress and therefore more errors during a real resuscitation. Bottom line: Simple. Brilliant. Worth looking into. I’ve talked about this before, but possibly not in the articles of the month. This is a systematic review looking at the safety of using epinephrine in digital nerve blocks. They found a total of 39 relevant articles, although only 12 of them were RCTs. They report no cases of necrosis attributable to epinephrine. In total, they found 2797 reported cases of digital nerve blocks using epinephrine without any important complications. Bottom line: This was a myth. Epinephrine is almost certainly safe in fingers and toes if you think it might help you. This is a prospective cohort of 3859 women aged 16 and over who presented to a single sexual health clinical in the UK. Before undergoing their consultation, they were asked to perform a vulvovaginal swab on themselves which was sent for nucleic acid amplification (NAAT). They then had the normal examination by the physician, with urethral and endocervical swabs sent, both for NAAT and culture. Overall, 2.5% of women tested positive for gonorrhoea (using a gold standard of either positive culture or two different NAAT markers being positive.) The self swabs were the most sensitive (99%), followed by physician swab for NAAT (96%), with the endocervical culture being the least sensitive (81%). In patients with symptoms suggestive of STI, both physician and self swab NAAT were 100% sensitive, but the endocervical culture was only 84% sensitive. This is another study by the same group, using essentially the same methods, but this time focusing on Chlamydia. They included a total of 3973 women. Again, the self swab outperformed the physician performed swab with a sensitivity of 97% (95%CI 95-98%) as compared to 88% (95%CI 85-91%). The reported specificity of 100% is essentially meaningless because they were using the test itself as the gold standard. Similarly, the sensitivity of both tests might be lower than reported as they were not compared to any other gold standard. Overall Bottom line: If there is not another reason for a speculum exam, it does not have to be performed solely to obtain cervical swabs. Unfortunately urine testing was not included in these studies, so we do not know how it compares to self swabs. Using tamsulosin for kidney stones? You must not be reading these e-mails. This is a prospective, randomized, double-blind trial of 403 adults with CT confirmed ureteric stones comparing tamsulosin 0.4mg daily to placebo. There was no benefit for the primary outcome of stone expulsion at 28 days, with 87% passed in the tamsulosin group and 81.9% in the placebo group (5.1% difference; 95%CI -3 to 13%). There was a difference in a secondary outcome, distal stones sized 5-10mm, with 83.3% passing as compared to 61%. Of course this is a secondary outcome, so should not affect your practice. More importantly, the vast majority of these people should not being getting imaged, so you will never know the size of the stone, making this information clinically useless. There was no difference in urologic interventions, pain, or analgesia requirements. Bottom line: Tamsulosin doesn’t help patients with ureteric stones. This is yet another paper indicating tamsulosin has no role in ureterolithiasis. (Its too bad we can’t just start with the high quality studies, rather than following the predictable pattern of a handful of garbage studies showing questionable benefit followed by a lot of time and money spent on multiple good trials that prove that there was never any benefit.) This was a prospective, double-blind RCT with 127 adult patients with CT confirmed ureterolithiasis, randomized to either tamsulosin 0.4mg daily or placebo. There was no difference in the number of patients in whom the stone did not pass (tamsulosin 62.1% 95CI 49-75%; placebo 54.4% 95%CI 40-67%.) There was also no difference in pain scores or analgesic use. Bottom line: There is no reason to be using tamsulosin in renal colic patients. They decided to do a review of tranexamic acid use in life-threatening hematuria. They managed to find 3 case reports and 1 prospective observational trial of 8 patients. There were no controls, so its hard to know what to make of the outcomes. It is good to know that none of the patients broke the emergency medicine rule that all bleeding stops… eventually. Bottom line: For patients peeing blood, you are free to make it up as you go. This is one of those really weird medical myths that I heard when I was younger and just stuck with me as a true. Apparently if you urinate in the Amazon river, there are little fish, called Candiru, that are attracted to the urine and will swim up your urethra. Once there, they have small barbs that lock them into place. These authors did an extensive review of both the scientific and non-scientific literature and report that there has never actually been a confirmed case of this occurring. For some reason, that is an amazing relief to me (and I have never even been to South America). Was I the only one raised on this particular myth? Bottom line: Feel free to pee in the Amazon, if that’s your thing. This is a retrospective look at data that was collected prospectively as part of 7 other asthma trials done at a single emergency department. In total, 1192 adult patients were included. They compared heart rate and respiratory rate between two predefined groups: severe asthma (defined as an FEV1 31-50% of expected) and life threatening asthma (defined as an FEV1 <= 30% expected). The HR and RR were not different between the groups (mean of 102 and 22 respectively). They then use logistic regression to show that only FEV1 and O2 saturation were related to the outcome of admission to hospital. Based on this, they conclude that HR and RR are not determinants of acute asthma severity. I think this is probably the wrong interpretation. They use FEV1 as their definition of illness severity rather than hard outcomes. The lack of correlation between FEV1 and vital signs in this study might equally indicate that FEV1 is not a good indicator of disease severity. (It is a disease oriented, not a patient oriented outcome.) Although FEV1 was correlated with admission rates at this hospital, I imagine this just represents the local practices of the hospital: they believe in FEV1 and therefore admit you to hospital if your FEV1 is low, even if you had no other indications for admission. Bottom line: I would still strongly suggest assessing patients clinically, including vital signs. Don’t let surrogate outcomes like the FEV1 or peak flow rates confuse you in asthma. Huff JS and Diercks DB. Use of Peak Expiratory Flow Rate Monitoring for the Management of Asthma in Adults in the Emergency Department. Revision of: American College of Emergency Physicians. Use of Peak Expiratory Flow Rate Monitoring for the Management of Asthma in Adults in the Emergency Department. Ann Emerg Med. 2001;38:198. Bottom line: Peak flow is a disease oriented outcome. Focus on patient oriented outcomes. This is a prospective, multicentre observational cohort study including a total of 1,168 adult patients with sepsis (although their definition was anyone admitted to hospital with an infection who received IV antibiotics.) The overall mortality of their cohort was 10%, so significantly lower than the trials of severe sepsis we are used to. In this cohort, the length of time it took to give antibiotics was not associated with mortality. Much like the prior studies that showed a higher mortality in patients with delays to antibiotics, we must be aware of the mantra: association is not causation. In the current study, the delay to antibiotics might have been because patients had less severe infections. On the other hand, in prior studies in which antibiotic delays were associated with increased mortality, we might guess that patients were misdiagnosed or inappropriately dispositioned, which could be the true cause of increased mortality. Why did this study come to a different conclusion? One possibility is simply the timing of the studies. It is impossible to practice emergency medicine these days without a keen awareness of sepsis. This heightened awareness may lead to over-treatment in general, such that the few patients that don’t get early antibiotics really don’t require them. Bottom line: Once you know there is a bacterial infection, obviously give antibiotics. However, there are many factors that will affect the timing of antibiotic administration and it should not be used as a quality of care metric. This is an open label observational trial with no comparison group,using a convenience sample of 40 patients and 50 total wounds. The wounds were either abrasions or skin tears. They used a cheaper skin adhesive that has not been tested for tensile strength (unlike dermabond). If tensile strength was required, a steristrip was applied before the glue. In follow up, there were no infections and only one patient needed anything else: his glue peeled off on day 3 and he had bandage applied. Of course, with no comparison group, all we can say is “Mikey likes it”. Bottom line: Glue works in skin. Perhaps there is a role for stocking the cheaper liquid bandaid products sold at drug stores? I always find it funny that I finished residency with a head full of practices, like PPIs for GI bleeds, that are demonstrably unhelpful, but at the same time there are potentially life saving treatments that I have never heard about. Albumin for spontaneous bacterial peritonitis is one of those treatments. These authors report a systematic review and meta-analysis of RCTs studying albumin for SBP. In total they found 4 studies that include 288 patients with limited heterogeneity and no evidence of publication bias. Only 1 trial was blinded, but with a hard outcome of mortality that might be less important. The administration of albumin (the 2 largest trials made sure to give it within 6 hours, so this might be an ED therapy) was associated with less renal impairment (OR 0.21 95%CI 0.11-0.42) and lower mortality (OR 0.34 95%CI 0.19-0.60). Dosing varied among studies, but the largest trial used 1.5grams/kg IV at the time of diagnosis and 1gram/kg on day 3. Bottom line: These are small numbers, but I will be giving albumin to SBP patients until we see more. I included the meta-analysis a few months back, but here is a multicentre RCT of 623 adult patients with CT confirmed uncomplicated diverticulitis (defined as lower abdo pain plus fever, an elevated WBC, and CT consistent with diverticulitis but no abscess or free air) randomized to either antibiotics or not. They used pretty big gun antibiotics: either a 2nd/3rd gen cephalosporin plus metronidazole or a carbapenem or piperacillin-tazobactam. There were no statistical differences between the groups. There were 3 perforations in each group. There were 3 abscesses in the no antibiotics group compared to none in the antibiotics group. 10 patients (3.2%) that started with no antibiotics were given antibiotics eventually. There were no differences in length of hospital stays or recurrent diverticulitis. Bottom line: It may well be that we don’t need antibiotics for diverticulitis, but these patients were all treated as inpatients, so its probably not up to us to make that call. I love this article, probably because it hits on two of my favorite soapbox topics: guidelines and antibiotics for sore throats. They searched for any major pharyngitis guidelines and found 10 from different countries and organizations. Two people individually coded each guidelines for all the major recommendations. The key finding of this paper is that despite all of these guidelines being “evidence based”, they arrive at wildly different recommendations. Several guidelines recommend prescribing antibiotics only if the patient is very sick or high-risk, but others suggest treating almost everyone. (If you want to find a guideline that tells you not to give antibiotics, look to Belgium, the Netherlands, England, or Scotland. Interestingly, these were the guidelines that were written by family doctors, as compared to specialists – I knew we had brains.) Not a single publication, including the Cochrane review, was cited by all the guidelines. When is a clot a clot? What is the evidence for treating subsegmental pulmonary emboli? This review identified 2 observational trials that included patients with subsegmental PEs who were not anticoagulated. Of the total of 47 patients with untreated subsegmental PEs, none had recurrent venous thromboembolism at 3 months. It would not be surprising if the harms of anticoagulation outweighed the benefits, but 47 patients can’t give enough information to decide either way. Bottom line: We still really don’t know what to do, but any treatment benefit is likely to be small. This is a retrospective chart review of 298 patients with confirmed PEs looking at the prognostic value of a positive high sensitivity troponin. 45% of the group had a negative troponin and therefore 55% had a positive trop. If the troponin was negative, no patients died, needed CPR, or received lytics. Among those with a positive trop, 6% died and 9% had either CPR or lytics given. For a retrospective study, this one is more likely than usual to give us a correct answer as death, lytics, troponin, and to a lesser extent CPR are objective values that are likely to be accurately recorded on a chart. Bottom line: It’s not surprising, but a positive troponin is likely a bad prognostic factor for PE patients. Less relevant than the pee fish article? This isn’t directly related to emergency medicine, but I was excited that after a few years of being “in press” the article based on my master’s thesis actually got published in print. This was a study that used qualitative methods to analyze the language of informed consent documents in genetics research. The main finding was that apparently simple, easy to understand language can be a source of miscommunication. This can occur because different people or groups of people will understand words differently. An example would be geneticists conceptualizing “disease” as an entity that may or may not cause actual symptoms in the future based on genetic predispositions, while their research participants may think of a “disease” as something they definitely have and will notice the effects of. Might this be applicable to emergency medicine? I think so, but without any good evidence. However, we know that when patients hear the words “congestive heart failure” they envision something that will kill within days – after all, their heart is failing – but this is not necessarily what we are trying to convey with those words. Similarly, we might talk about “low risk chest pain”, but different people might understand those words to indicate a 2% risk, or a 1 in a thousand risk, or a 1 in a million risk. Bottom line: Communication is essential in emergency medicine. It is an area that probably deserves more attention. What is the difference between surgeons and God? Rather than being focused on clinical aspects of care, this site is run by Jason Brooks, a performance enhancement coach, with the goal of improving performance (both in the ED and in life in general) and making it sustainable. High level athletes have coaches, why shouldn’t we? I really enjoyed the first few podcasts. Enjoy the free open access medical education? Think you know someone else who might? It would help me a lot if you spread the word and shared this resource with just one of your friends or colleagues. Even easier, you could also help by just clicking the like button on Facebook. Thank you so much!